Jeff Plankenhorn is a larger than life presence on stage. A big man with a kind smile and generous demeanor, he is often the bedrock that binds a host of talents into a moving whole. Then he picks up his slide, looks down in his lap and the joint starts hopping. 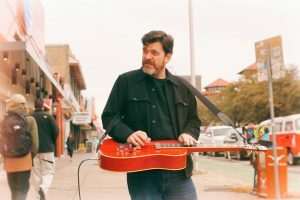 Plankenhorn made his name in Austin as a preeminent guitar slinger, especially as a slide specialist and is increasingly known for his impressive songwriting and powerful voice. His musical repertoire is both broad and deep, moving effortlessly through folk, country, blues, bluegrass, gospel, rock and soul. He has five albums to date, including his latest Sleeping Dogs. White Eagle Saloon, 836 N Russell Street. Wednesday, November 7, 8:00 pm. 21 & over. $10.00, available in advance at Cascadetickets.com.